Today marks the Winter Solstice for those of us in the northern hemisphere, and Summer Solstice for those in the southern hemisphere. While the solstice is often assumed to be the shortest (or longest) day of the year, though the complexity of planetary motion means that isn’t quite the case. It does, however, mark the lowest (or highest) transit of the Sun across the sky, and it is what’s often used to mark the change of season. But of course that only applies to Earth. What about the other planets? Because Mercury’s orbit is rather elliptical, the path of the Sun through Mercury’s sky is rather complex. Mercury rotates at a relatively constant rate, but its orbital motion speeds up and slows down due to its orbital eccentricity. This means that the motion of the Sun is generally East to West, as it is on Earth, but there are times when the Sun can be seen to stop, move West to East for a while, then stop and return to its general East-West motion. It occurs about every 58 days, so that would like mark “high summer” on Mercury. The axial tilt of Venus is only about 3 degrees, compared to 23 degrees for Earth, so the seasonal variation of Venus is smaller. Venus also has a very thick atmosphere, so there isn’t much of a temperature variation with the seasons. However due to Venus’ smaller orbit, each formal season would last only about 56 days instead of Earth’s roughly 90-day seasons. Mars has an axial tilt similar to Earths, and also has a more elliptical orbit. Combined with a thinner atmosphere, this means that martian seasons are actually more extreme than Earth’s. Because of this, the ice caps of Mars are structurally very different. The northern ice cap is water ice, and in winter is covered with a layer of carbon dioxide. The southern ice cap has a permanent layer of carbon dioxide about 8 meters thick. For this reason it was once thought that the northern ice cap was water ice and the southern carbon dioxide. Jupiter has a small axial tilt, so again seasonal variation is relatively small. Seasons do, however, last about 3 years. With a similar axial tilt as Earth, there is some seasonal variation to Saturn’s atmosphere. It’s thought that the rings could also play a role, given that they block varying amounts of sunlight at different times of the year. Because the orbits of Saturn’s moons are typically along the equatorial plane of Saturn, Titan’s seasonal variation depends more on the tilt of Saturn than its own axial tilt. This is something we’re only beginning to study. The axial tilt of Uranus is about 82 degrees, which means Uranus is basically a world on its side. This means that for 20 years one pole of the planet is bathed in sunlight while the other is in constant shadow. Winter and Summer are therefore quite extreme in terms of sunlight. But Uranus is so distant from Earth that this is less of a factor than the planet’s own internal heat. Given Neptune’s distance from the Sun, it was long thought that seasons would be non-existent on the planet. 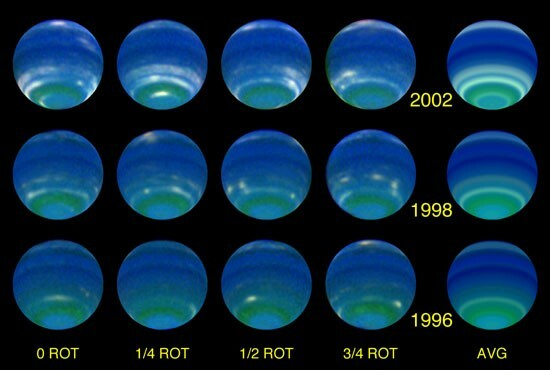 But we’ve now seen that Neptune’s atmosphere does seem to go through seasonal variations. Since Neptune’s seasons last 40 years, it will be a while before we’ve observed a complete seasonal variation of the planet. What about Pluto? We don’t know yet. There’s some indication that it’s elliptical orbit causes variation in the amount of atmosphere the planet has, but we’ll have to wait for New Horizons to make its flyby before we know more. We all accept that we are apart of dark matter, but after the big bang we belong to the universe. Your holding in your hands the shape of the universe (SKY), it seems simple to you but is the key answer to all your questions. You need to sit and work on this. Those answers come from a powerful theory who put you to sit right on the edge close to the darkness, where you can see everything. In the first place where you have been, you can see how the powerful theory holds the elements, objects, and bodies. Who hold our planet, our sun and universe. With his energy chose third level, third element to wear on you and with this you can go through around the universe, galaxies, planets, and stars. He chose you on how to stand up infront of planet and sun to touch the light, but your afraid your going to fall. Your looking behind the sun and “it not for you”. On both side of this theory you can see two elements, their face human but the body animals. The universe is science place. I don’t want it to be to nobodys way but on a simple way I try to share my thought and THANK YOU TO YOU because I don’t want the sky screaming like it did once, it was bad. I wish you to have a wonderful holidays with your family and friends around you. Another succeasful year for you.